Sicilian Jews were among the first people in Italy to adopt foods brought to Europe by Spanish explorers returning from the New World—like tomatoes and peppers. When Spanish rule of Sicily in the late 1400s forced Jews north into central and northern Italy, they carried their food traditions and preparations with them. Many Italians regarded these new foods with suspicion or disdain, calling eggplants “vile” and dismissing peppers as “poor man’s food.” But, of course, eventually they came around. 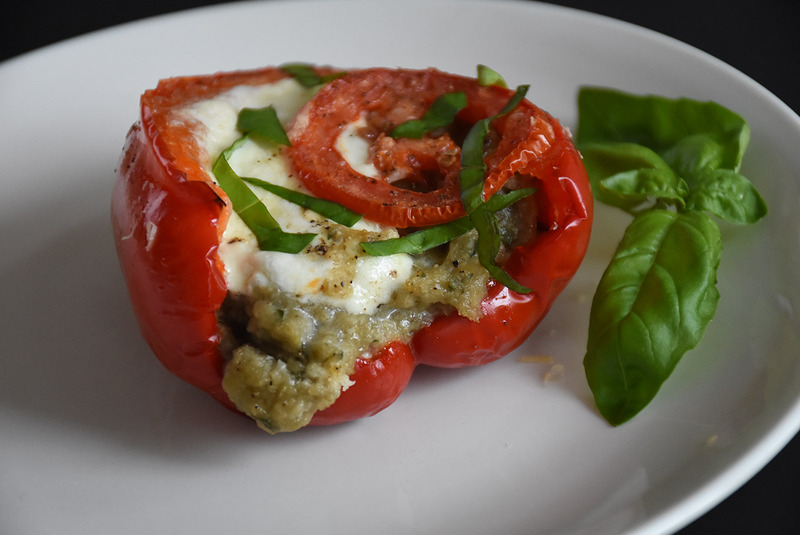 Peppers became welcome in many recipes, but one prized by Sephardic Jews was stuffed peppers. That hollow core and box-like structure just called out for a filling. Meat and grains were common fillings, and in Italy, cheese fillings were especially prized. Interestingly, even after peppers became popular across Europe, Ashkenazic Jews didn’t wholeheartedly adopt peppers into their cooking—except for stuffed peppers. Jewish families prepared them for everyday meals and also the fall festival of Sukkot, because stuffed foods symbolize abundance and a good harvest. One Jewish-Italian version, featured in Joyce Goldstein’s Cucina Ebraica, calls for stuffing peppers with eggplant. The dish not only captures summer’s bounty at its best, but also celebrates in one beautiful package the culinary contributions of Italy’s Jews. The traditional filling is fried, but I prefer the texture and flavor of char-roasting the eggplant and pureeing it with roasted garlic and a squeeze of lemon. This method recalls the beloved Middle Eastern eggplant dip baba ghanoush, sometimes called “poor man’s caviar”—fitting in this recipe that showcases foods that were once scorned by many. Here the mixture gets a strong herbal boost from basil, salty depth from Parmigiano-Reggiano and body from panko or breadcrumbs. 1. Preheat broiler. Rub the eggplants and garlic with olive oil and prick eggplants all over with a knife or fork. Place eggplants and garlic on a rimmed baking sheet and broil until garlic is browned and tender (remove if it is done before the eggplant) and eggplants are charred and shriveled, turning a few times, about 30 minutes. Let the eggplants cool about 15 minutes. 2. Meanwhile, place peppers skin-side up on a baking sheet and coat lightly with olive oil. Broil about 5 to 9 minutes, until the skins just start to brown. Remove. Turn oven to 375 degrees and adjust rack to middle position. 3. Peel the garlic and eggplant skins and discard, placing flesh in a large bowl. If liquid accumulates in the bowl, drain most of it out before proceeding. Using an immersion blender (or mashing by hand), make a thick puree. Squeeze lemon over the mixture and stir in basil, panko or breadcrumbs, salt, black pepper to taste and 1 heaping tablespoon of the Parmesan cheese (save the rest for the topping). Taste and adjust seasonings as needed. 4. Coat a baking dish with olive oil. Arrange the peppers hollow side up in the dish. Spoon in the eggplant mixture. 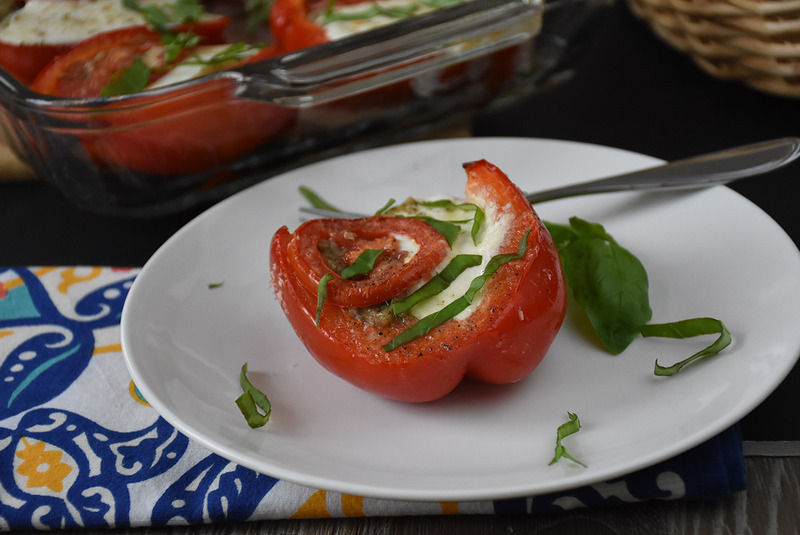 Top with a slice of Roma tomato slightly overlapping a piece of burrata or mozzarella. Spread the remaining Parmesan over the top and sprinkle lightly with black pepper. 5. Bake for 15 to 20 minutes, until the cheese is melted and the tomatoes tender. Serve warm, garnished with more fresh basil if desired. Marcia Friedman is the author of Meatballs and Matzah Balls: Recipes and Reflections from a Jewish and Italian Life. She continues to write about her journey and the intersection of Jewish and Italian food at meatballsandmatzahballs.com.